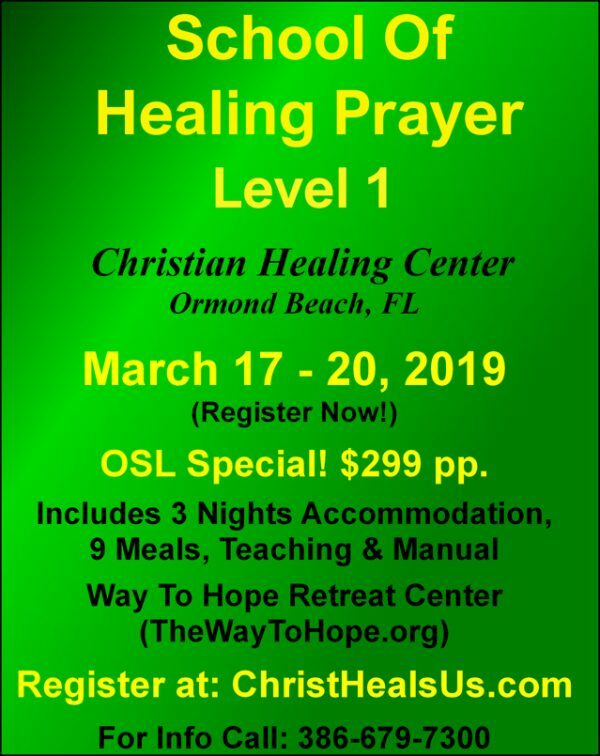 Join us for a 3 day School of Healing Prayer Training. The cost includes: 3 days accommodations, 9 meals, all teaching sessions and course manual. Level 1 is scheduled for March 17-20, 2019. The Cost: Only $299 per person! 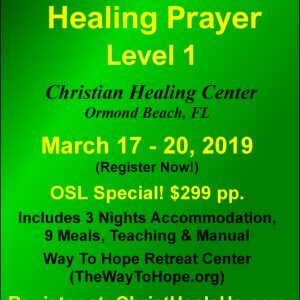 Join us for Level 1 of the School of Healing Prayer. Level 1 provides a foundational, practical approach to becoming a prayer minister and/or developing a prayer ministry. This course offers a scriptural basis for God’s gift of healing prayer and teaches the student how to be an effective prayer minister to help those that need healing and deliverance. This course is taught at our Way To Hope Christian Retreat Center in Pierson, FL. The cost includes 3 days accommodation, 9 meals, teaching and course manual. We will complete Level 1 of the School of Healing Prayer in a 4 day training session with breaks for meals, prayer and leisure time. The Way To Hope Home is part of our 10.5 acre Oasis of Hope property, which includes a prayer chapel, swimming pool, lake and dock. Come and experience the fellowship of the Holy Spirit and other like minded Christians while you receive the training you need to become an effective prayer minister.